Frank Vincent Zappa (December 21, 1940 - December 4, 1993) was an American musician and composer. He was known for his strange style of music, which was often weird and funny. He made various types of music and many albums. Zappa worked with many other musicans, most notably his 1960s group The Mothers of Invention and his friend and blues singer Captain Beefheart. Zappa was born in Baltimore, Maryland, but spent most of his life in Southern California. He grew up in Baltimore, in Florida, and in Monterey, Claremont and El Cajon, California. His mother was of French and Italian descent; his father was an immigrant from Sicily. Zappa had four children with his wife Gail. They gave them all very unusual names: Moon Unit, Dweezil, Ahmet, and Diva. Zappa was openly against drugs, Televangelism, and censoring music. He often tried to see what he could get away with. 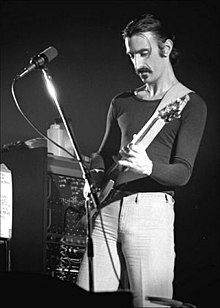 Zappa died from prostate cancer in Los Angeles, California. ↑ Hear Frank Zappa (music and interviews) on the Pop Chronicles (1969). This page was last changed on 8 March 2015, at 23:40.